Killamarsh Heritage Society have recently adopted the planter at the bottom of Bridge Street, next to the B & C Funeral Parlour. 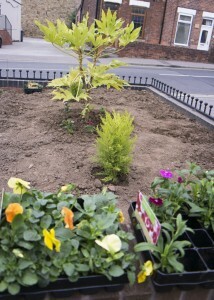 We do hope that everyone enjoys the planting as it matures, and also the spring bulbs which will appear next year. Below are some photographs taken on the day of planting (Copyright Ian Beck). 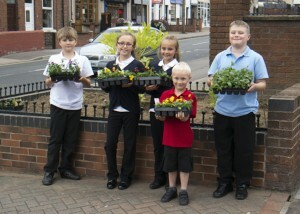 Above: Killamarsh School Children helping us to put in the plants. Pictured left to right: Alex Mason, Megan Beck, Caitlin Jones, Billy Robinson, Levi Collins. 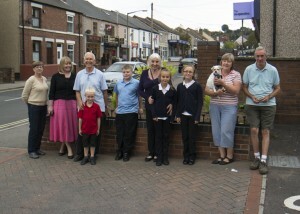 Above: Members of Killamarsh Heritage Society with the Killamarsh School children. Left to right. Janet Jackson, Margaret Slack, Tony Ward, Billy Robinson, Levi Collins, Pat Bone, Caitlin Jones, Megan Beck, Joan Talbot (with Willow), Barry Talbot. Thank you to the members of Killamarsh Heritage Society for donating the plants, for their hard work in digging the planter over and putting in the plants, and for keeping up with the watering.